I'm reading on this website that physical inactivity - which would include sitting at a desk in front of a computer all day every day - is a contributing factor to many physical and mental health problems. I know it has certainly been a contributing factor to weight gain for many people. Gone are the days when daily activities were enough to keep people in shape. Now we sit at a desk all day and have to go to the gym to stay in shape and healthy. Or, and this is more likely, sit at a desk all day and talk about going to the gym. Someday. Here's an interesting idea to at least get people moving a bit- the Multi Table electronic desk. The height can be easily adjusted, lowering to just over 2 feet, and raising slightly lower than 4 feet, adjusting to individual needs and comfort. 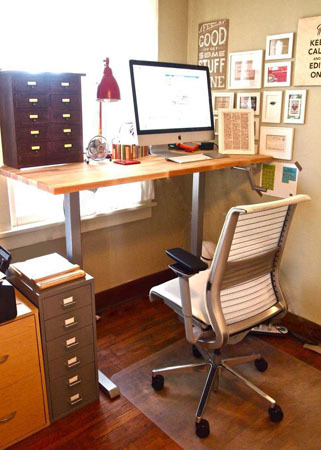 People can raise the work surface and stand up periodically throughout the day, and still be able to continue working. The website says that periodically standing during the day can significantly decrease health risks for both heart disease and cancers. We're not even talking about working out or exercising here. We're just talking about standing up periodically and working while standing instead of sitting in that same desk chair all day. Would that be worth a try for these potential health benefits? Companies need office furniture anyway. I think it would be great if they provided something like this, giving employees the option of adjusting their work surfaces and positions throughout the day. Not only would it be better for the employees' health, it would probably make them more productive, too. What do you think? Do you work sitting down all day? Would you like one of these adjustable tables? Me, I'm at home sitting on the couch (or the floor) working on my laptop all day and jumping up to do this, that, and the other thing all day, so I guess I'm standing periodically. Truth be told, I'm doing all that other stuff before I finally manage to sit myself down at the computer to get something done, which is why I end up staying up so late, but that's beside the point. If I was to work in an office all day, I'd want to be able to adjust my position throughout the day. My neck and shoulders are starting to tighten up just thinking about sitting in one position all day - and all that other stuff that wouldn't get done without me. Is a standing desk is right for me?